Whether you’re a student or parent, back to school season is a hectic time of fresh starts and new timetables. While you reorganize your fall schedule, why not refresh your Eminence Organics skin care routine as well? For students, we’ve put together a routine that you can pick and choose from to kick off your school year right. For moms, we have a couple of back to school skin care tips for busy parents. Make this season a successful start to the school year with re-inspired skin care for the whole family. Formulated with our exclusive Youth Shield Complex, Red Currant Exfoliating Cleanser both hydrates and invigorates the skin. This two-in-one step for both cleansing and exfoliating purifies easily congested youthful skin and helps speed up busy school mornings. Balance your skin with this revitalizing and hydrating toner infused with nourishing stone crop. If your complexion tends towards a shiny look, Stone Crop Hydrating Mist leaves your skin appearing fresh and matte. The Charcoal T-Zone Purifier draws out oil, dirt and bacteria and leaves a smooth and matte appearance to the complexion.Deep clean and refine pores with our Balancing Masque Duo, especially formulated for combination, oily and problem skin. Our Red Currant Protective Moisturizer from the Youth Shield Collection refreshes the complexion with sustained release tea tree oil, reducing the visible signs of problem skin. SPF 30 protects against the aging effects of broad spectrum UV rays, keeping your skin looking youthful. School = stress, which often reflects poorly on your skin. When stress-related breakouts pop up during back to school season, you’ll need Clear Skin Targeted Treatment to control problem areas for fast and effective results. Eminence Organics Blueberry Soy Exfoliating Cleanser removes impurities and tightens pores for a luminous, youthful glow while our Lime Stimulating Masque brightens and revitalizes your complexion. Together, the combination gives your skin a rosy and rejuvenated appearance. A delightful back to school treat for moms, this mixology will re-energize your skin during a hectic season. Looking for even more “me time”? 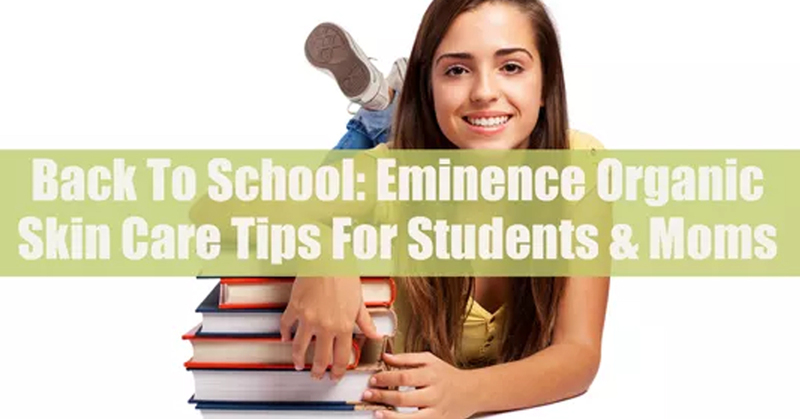 With the kids finally back to school, now’s the time to book that facial at your favorite authorized Eminence Organics spa. We have both students and moms here at Eminence and we’d love to ask you – how do you feel about going back to school or sending your kids off? Do you find the change in routine stressful – and how does that affect your skin? Tell us in the comments below or join the conversation on Facebook, Instagram or Twitter!